See available camo fleece fabrics below. 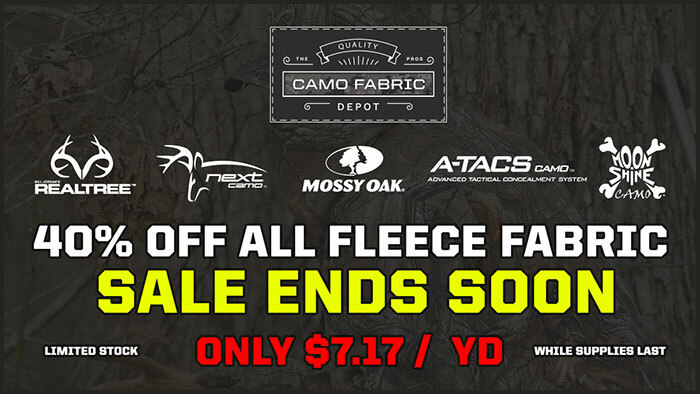 For a limited time, Camo Fabric Depot is offering camo fleece fabric at 40% off! If you are looking for the right fabric to create your next holiday gift or just want to craft a warm and cozy project, this camouflage fleece fabric is the perfect fit. This polyester fleece is a soft, fuzzy fabric that can be used for sweaters, sweat shirts, jackets, mittens, hats, blankets, or any other applications where a soft, warm material is needed. This fleece fabric would also be ideal for making Christmas novelties, stockings, skirts, etc. Camouflage fleece fabric is increasingly becoming a popular fashion fabric and with our beautiful camo pattern prints from Realtree, Mossy Oak and Next Camo these are sure to satisfy anyone’s camo craving. I will be honest; I don’t sew much. As a novice sewer, I found this fabric easy to use. I bought a few yards to sew up a simple dog bed for my labrador retriever and although I made a few sewing mistakes my Molly loves her new bed. I feel that anyone looking for a beautifully printed camo fabric that’s easy to use will be happy with their purchase of this fabric. Here you will find the current camo fleece fabric available here at Camo Fabric Depot. I will be adding more as they become available. Don’t miss out on this deal! Prices will go back up before you know it! These fabrics are on sale for a limited time. Don’t wait as our supplies are limited. Get your fleece at 40% off!